This is a book of secrets. Or, more correctly, a book on how to obtain secrets. It is a synthesis of ideas made to center on one useable theme; that, by allowing our Querents (those who seek our insights) their masks, they reveal to us their truths. Our work, as Readers, Tellers and See-ers thus becomes more "telling". This is the intriguing first paragraph of The Masks of Tarot, a book revealing a unique, interactive reading method utilizing only the 22 Major Arcana cards of the tarot. The book generously provides a sample Hiding Places analysis for each of the 22 Major Arcana "masks". While the template stands as a necessary foundation for the process, you are encouraged to use your intuitive skills to provide your own assessments when doing a reading. The next part of the book offers an additional layer of reading, where we get to see every card read in each archetypal position (Mask, Beast, Light, Shadow). The Hiding Places template can also be used with different systems (not just tarot). The author shows us how it works with The Alchemy of Human Needs, the Myers-Briggs Type Indicators, Enneagram/Personality Types, and Hand Types for use with palmistry. Once the initial reading is done, you can then move onto the related Hiding Places Spread, a 5-6 card spread which utilizes, then expands on, the Hiding Places System. The spread is interactive as well, as the cards are deliberately chosen by the querent. There are four sample readings included. At the end of the book, there are several worksheets for practice, along with a 6-page list of keywords (emotions and personality types) for sparking your imagination when using the Hiding Places System. I won't go into the details of how the ingenious system works (you'll need to buy the book for that), but I can tell you that I applied the Hiding Places System to my own favorite tarot card (my own personal mask) and the assessment made a lot of sense. I actually laughed, because it hit pretty darned close to home! 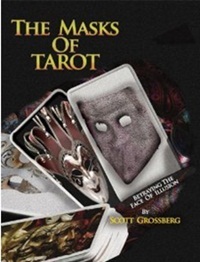 The Masks of Tarot provides a fascinating new way of looking at the Major Arcana cards and how they relate to one another. A detailed study of the concepts in this book will not only offer a new way of reading the cards, but will also greatly expand one's understanding of the cards themselves, thereby enriching any reading performed, with or without this system. Book review originally published on my previous blog (Tarot Dame) on 7/19/11.